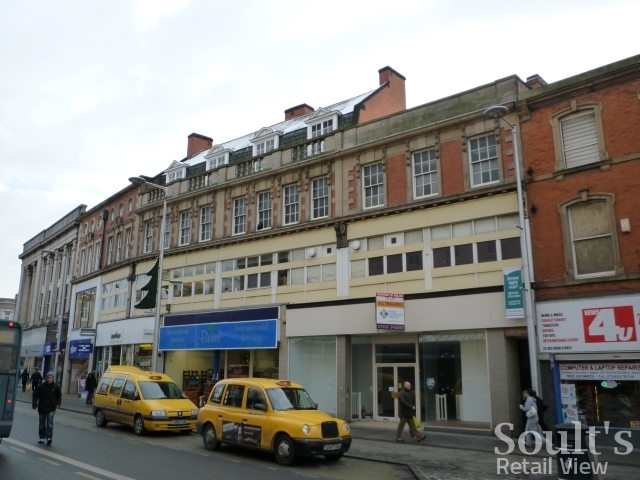 Back in January I blogged about Burton upon Trent’s original Woolworths store, and promised to turn my attention in a future post to the nearby city of Derby. 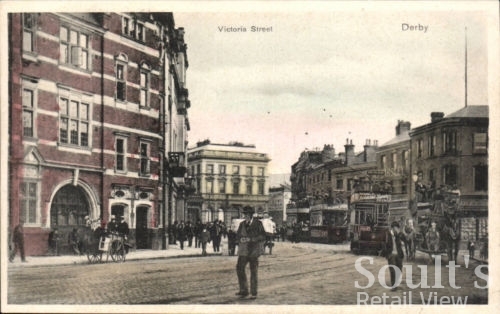 Just as in Burton, another old photograph – this time from a 1938 postcard – is to thank for me finding the location of the city’s original Woolworths store at 28-33 Victoria Street (store #29). 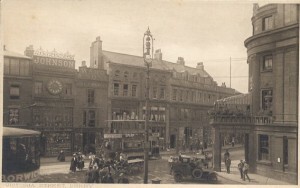 From the store number, Woolies must have opened on this site in about 1914. To avoid having to stand in the middle of the road, I hope you’ll forgive my modern equivalent shot not being from quite from the right angle. However, just as there is plenty of continuity between the two Burton photos, it’s remarkable quite how similar today’s view of Victoria Street is to the one from seventy years ago, with all the principal buildings from the old shot – including the former Woolies on the right, the Royal Buildings on the left, and the imposing HSBC at the end of the street – still in place. The earliest Woolworths stores tended not to occupy purpose-built premises, though many of those shops – such as Leeds (#5, opened 1911) or Leicester (#49, opened 1915) – were subsequently rebuilt in a distinctive Woolies style. 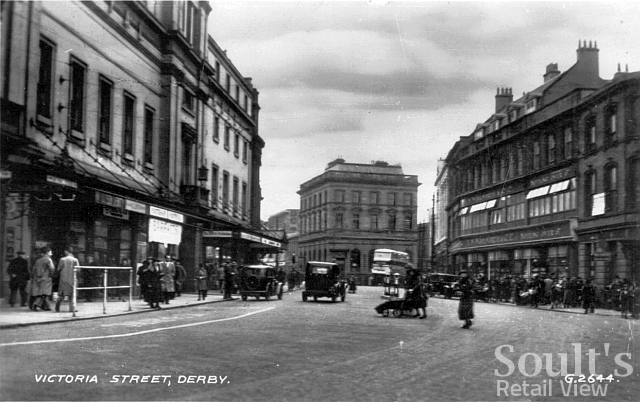 I’m not clear whether the same was true of Derby; photographs that I’ve seen from the first years of the twentieth century (such as the c.1908 image above) appear to show the site occupied by earlier buildings at that time, but the shot below – thought to date from before 1918 – has today’s familiar property in place. 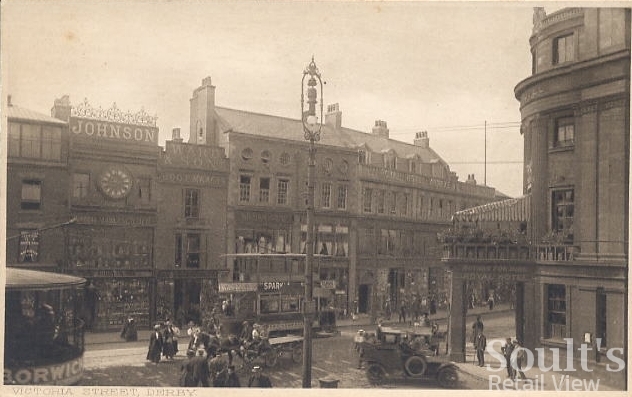 Unfortunately, the detail is a little too fuzzy to be certain whether the card shows Woolworths occupying those premises. For all the similarities that I’ve mentioned between the old and new photographs, it’s unfortunate – if not unexpected – that the Woolworths building has been clumsily subdivided over the years in a manner that pays little respect to its architecture. 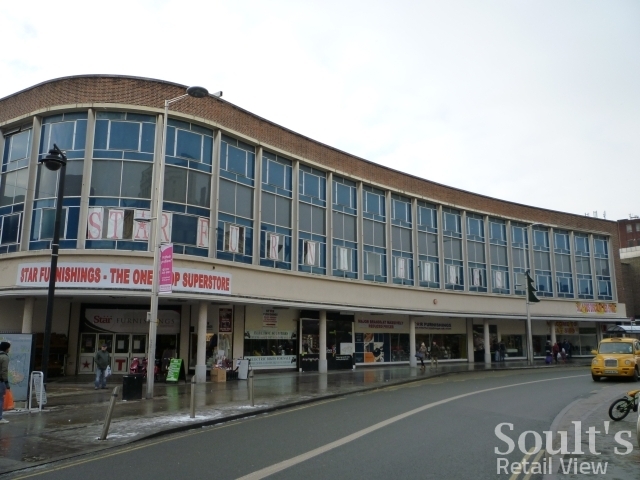 Ugly fascias and shopfronts detract from what is really – as the older shots remind us – quite a pleasing property. Today, parts of it are occupied by the health and beauty chain Savers and a branch of the thriving H&T Pawnbrokers chain, while another chunk is a former Evans store. 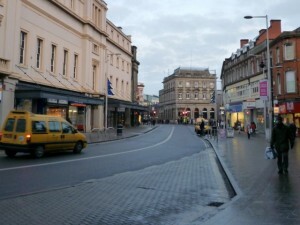 In the extensive city centre reshuffle that followed the 2007 opening of Westfield Derby, Evans moved to the previous Topshop site; meanwhile, Victoria Street is left with a distinctly downmarket offer and quite a few voids, including an 80,000 sq ft empty Debenhams following the department store’s own relocation to Westfield. Of course, retailers moving from one part of Derby city centre to another is nothing new – after all, it’s what Woolies did in 1975, when it left Victoria Street and moved to the newly-built Eagle Centre. More of that in a subsequent post. However, Debenhams moving to a bigger store in the Westfield centre has left an especially big hole, and it has to be hoped that a permanent solution for the lovely Modernist building – originally designed for Ranby’s department store in the early 1960s by Evans, Cartwright and Woollatt, but now owned by Westfield and occupied by a short-term tenant when I visited – is found soon. does anybody recall the window collapsing in Woolworths Victoria. Street Derby Store. II would imagine it was sometime in 1946-1948. 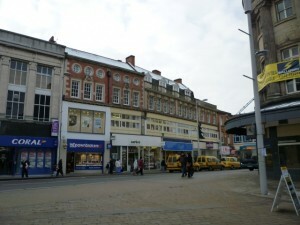 Hi has anyone any idea how to find when Woolies opened in Chesterfield Derbyshire? I have framed some cardboard Christmas decorations my grand-father bought the 1st Christmas Woolies opened there & I would love to find which year that was. My Mom is 88 & she remembers him buying them but not which year. Thanks in anticipation. I can tell you, Mary! The original Chesterfield Woolworths at 21 Burlington Street opened on 28 September 1929, so your grandfather must have bought the decorations for Christmas 1929 when your mum would have been a toddler! Thank you Graham. She thought she must have been older but I told her that even at almost 4 it would have been something kind of momentous in her life so she may have remembered it from an early age. Then of course there is always the fact she was told later when he bought them & she thinks she remembers. My grandmother never refuted her story ,which I have heard since I was a child so it must be correct how ever she actually has the memory. Some more picture can be found by searching Eagle Center for the original Eagle Center store before that was reduced in size and before relocation to its last place in the center before it closed.